High Five is a positive interaction happening between excited people . What if we have more chance to do high five in everyday life? High-Five camera is an interactive web application that encourages people to do high-five more and captures a gif image of that moment to record the energy and share with others to create vibrant communities. 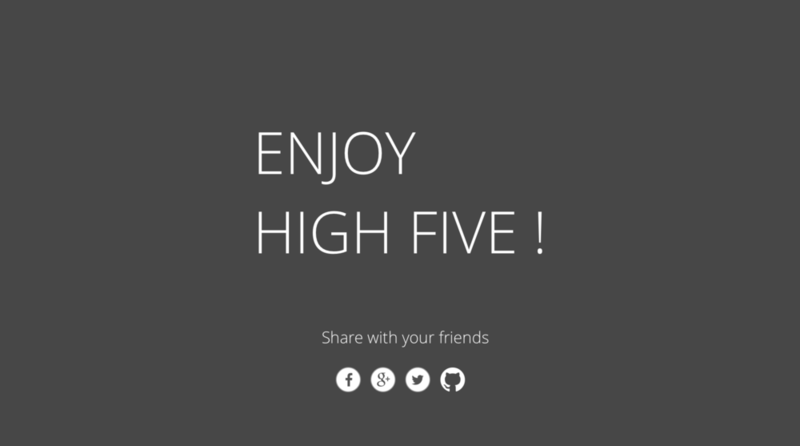 You can visit High Five Camera by clicking the image below. I was deeply inspired by the James-Lange theory which refers to a hypothesis on the origin and nature of emotion. In other words, our physical reaction could impact on our emotion. Then, I came up with an idea. Can I encourage people do high-five more to create an exciting and vibrant communities? This project was exhibited in ITP Winter show 2013. I’ve contacted by a variety range of people from artists to educators. They wanted to try this on their place. I am looking forward to develop further to involve more communities to promote and encourage more positive physical interaction.